Datastore calls such as ndb.get_multi(), ndb.put_multi(), or ndb.gql(). Memcache calls such as memcache.get(), or memcache.get_multi(). URL Fetch calls such as urlfetch.fetch(). Mail calls such as mail.send(). Optimizing or debugging a scalable application can be a challenge because numerous issues can cause poor performance or unexpected costs. These issues are very difficult to debug with the usual sources of information, like logs or request time stats. Most application requests spend the majority of their time waiting for network calls to complete as part of satisfying the request. Is your application making unnecessary RPC calls? Should it cache data instead of making repeated RPC calls to get the same data? Will your application perform better if multiple requests are executed in parallel rather than serially? The Appstats library helps you answer these questions and verify that your application is using RPC calls in the most efficient way by allowing you to profile your RPC calls. Appstats allows you to trace all RPC calls for a given request and reports on the time and cost of each call. Optimizing your application's RPC usage may also reduce your bill. See the Managing Your App's Resource Usage article. There is nothing to download or install to begin using Appstats. You just need to configure your application, redeploy, and access the Appstats console as described in the steps below. The Appstats library takes care of the rest. To use Appstats with WSGI request handlers, including WSGI frameworks such as webapp2, you must wrap your WSGI application with the appstats middleware. The simplest way to accomplish this is to define a WSGI middleware to wrap every WSGI application using appengine_config.py. Before invoking your WSGI application, the runtime will import this file and call the webapp_add_wsgi_middleware function, if found. See Optional Configuration below for more information on appengine_config.py. The Appstats middleware must be the first item, so the profiler can include other middleware in its statistics. 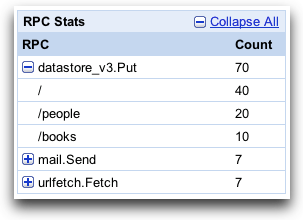 The Django middleware calls Appstats to record events, as appropriate. You do not need to change any other application code. Note: By default, the Appstats console can only be accessed by application administrators. The handler does not need to be restricted in configuration with login: admin. You can configure the behavior of Appstats by adding content to the appengine_config.py file in your application's root directory. For a complete example of configuration options, see the file google/appengine/ext/appstats/sample_appengine_config.py in the SDK. If your request handlers modify sys.path, you must make the same modifications to sys.path in appengine_config.py so the Appstats web interface can see all files. AppStats can keep track of RPC cost as well as time. If your application is fast enough but more expensive than you expect, look for operations that cost more than you expect. To turn on cost tracking, set appstats_CALC_RPC_COSTS = True in your appengine_config.py file. You can test your Appstats setup with the development server. If you configured the console path to use the default URL above, you can access the console at http://localhost:8080/_ah/stats/. Once you are satisfied with your Appstats setup, deploy your application. If you configured the console path to use the default URL above, you can access the console at http://your_app_id.appspot.com/_ah/stats. If you have enabled the API cost tracking feature, this will also display costs. The RPC Timeline graph shows when specific RPC calls were made and how long the requests took to process. The RPC Total bar shows the total time spent waiting on RPC calls, and the Grand Total bar shows total time spent processing the request. As you can see from the timeline below, the majority of time was spent on RPC calls. This is often the case. The other tabs show additional information about the request. 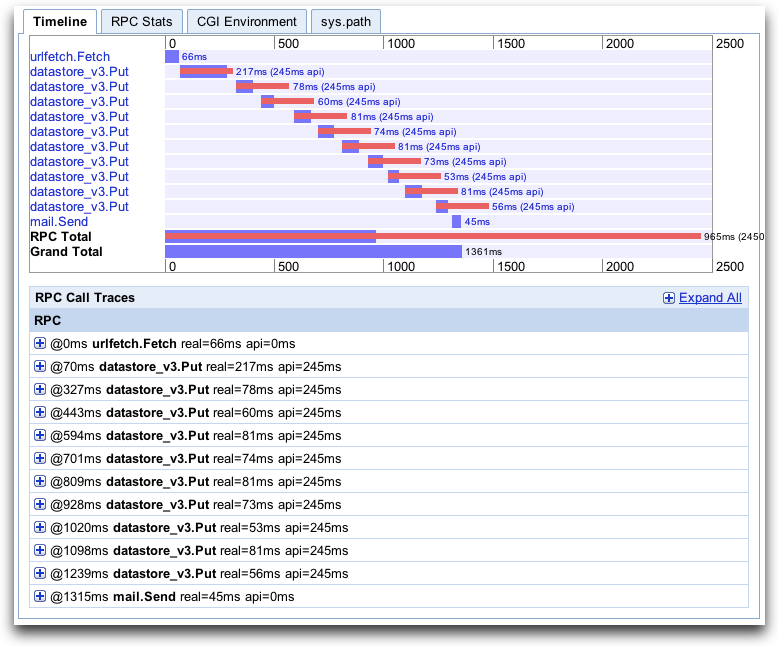 Understanding the impact of RPC calls on your application response time is invaluable when analyzing its performance. The Interactive Playground allows developers to enter arbitrary Python code into a web form and execute it inside their app's environment. After navigating to Appstats, click the link for the Interactive Playground. A form with a single text area will display. Enter any arbitrary Python code you like in the text area, then submit the form to execute it. Any results that were printed to the standard output are displayed next to the text area, and a Timeline analysis of the RPC calls generated by your code is displayed. Warning: The Interactive Playground has the same access to the application's environment and services as a .py file inside the application itself. Be careful, because this means writes to your data store will be executed for real!